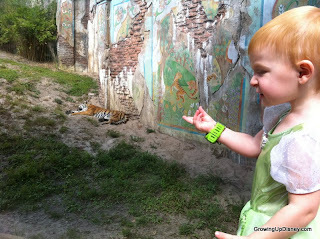 Disney's Animal Kingdom Park is a great place for small children. I also happen to think it's an excellent park for adults too but that is a different post. I'll summarize that thought for now by saying this isn't an "in your face" park. You need to slow down, take in the details, watch the shows, and not just run from ride to ride in order to appreciate this park. In particular, the animal trails are fantastic. 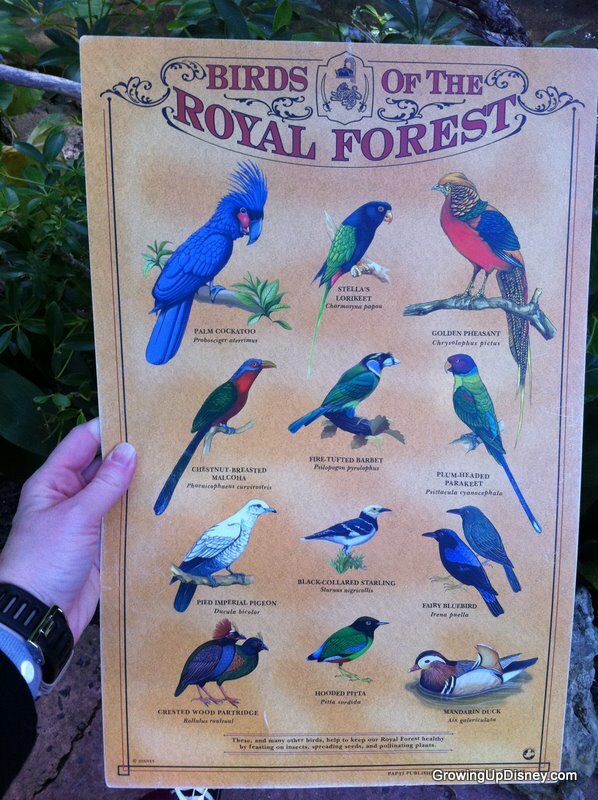 First, let's look at the Pangani Forest Exploration Trail. This is a self-guided walking trail through lush vegetation and along the way you'll find a variety of animals beginning with monkeys, okapi, naked mole rats, and all sorts of other creatures. If you are traveling with toddlers, they'll find lots to explore. Consider their slower pace as a chance to examine detailed work of the Imagineers. The pathways are rather wide and you won't be blocking anyone else if your child wants to stop and check out a leaf. This section of the trail includes a waterfall, ducks, and lots of fish. We were all able to move to the side of the path and let Tink watch the fish for a while. It was nice to give her a little freedom since it wasn't an overly crowded area. About halfway through the attraction, there were a few places to sit and give everyone a water break. The rest of us were glad to rest for a moment, even if Tink was still ready to go. It's not an overly long walk, but it was "Animal Kingdom hot" on this day. There are Cast Members throughout the area, ready to answer your questions about the animals. Some give brief presentations. Below, Tink found a Cast Member who was ready to run and they took off. The "stars" of the Pangani Forest Exploration Trail are the gorillas. There are several locations for observing and photographing these fascinating creatures. Earlier in the day, we took in the Maharajah Jungle Trek. Tink was asleep before we entered and snoozed through the whole attraction. Which brings me to another great thing about these animal trails- they are stroller friendly, so no unpacking of your gear and more importantly, no disturbing a sleeping child! The jungle trek features animals found in Asia and the tiger is the star. Please note that this attraction does include a bat house. If you or your child are frightened of bats, it's quite easy to bypass that portion of the trail and continue on to observe the other animals. Other than the bats, you'll find both trails to be similar in concept: broad pathways, helpful Cast Members, and a wide variety of animals and plants to explore. Let your little one take a walk on the wild side on your next Walt Disney World vacation with a stroll through one of Disney's Animal Kingdom Park's animal trails. 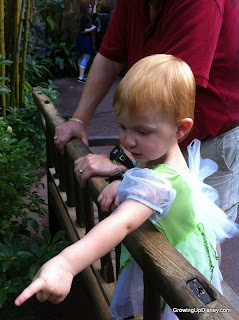 Tink was awake this time for the Maharajah Jungle Trek. The tapir was nowhere to be seen and we skipped the bat house. She loved the tigers and kept meowing at them. Our visit was after lunch on a rather warm day so most of the animals were lounging. 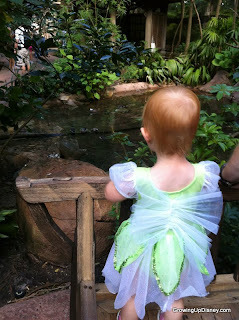 Tink loves birds, especially ducks, so the aviary was a favorite. 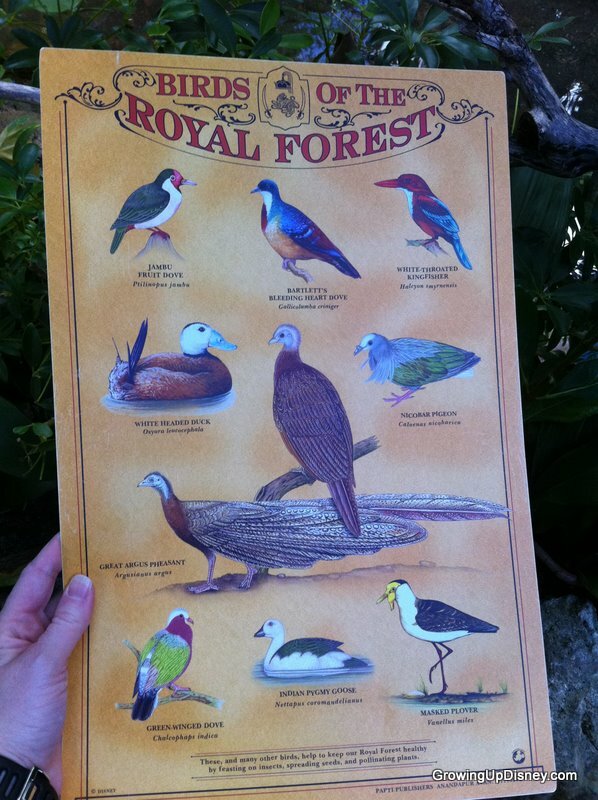 Pick up a guide when you enter the aviary to help identify the birds you'll see. My son loved the trails so much! When we went he had broken his foot, but he still got down and walked the trails! I completely agree that Animal Kingdom is a great park for kids. I particularly love that we can go at the kids' pace. My middle daughter loves animals and I actually think she could have spent the entire vacation just walking the trails, well if they added a few princesses along the way, we may actually have NEVER gotten her out of there! Before kids, we did not appreciate this park as much as we should have! I love this park and particularly enjoyed the trails last year as I was pregnant and couldn't ride on the safari. We loved the gorillas and spent ages watching them. A really cool place for kiddies and for taking your time. Great post. I was so excited to see your blog featured on Life of a Sippy Cup Mom today! 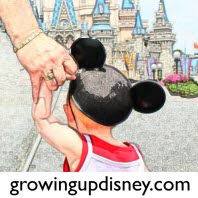 My husband grew up as a Disney kid (charter passes!) and has logged hundreds of visits and is hoping to share the experiences with our daughter (currently 20 months). She made her first trip to EPCOT with us earlier this year, and Animal Kingdom is next on our list for all the reasons you've mentioned. I look forward to reading more tips and tricks to pass on! Welcome Erin! Glad you found us. My daughter is just a little younger than yours so hopefully I can help. We're going back in 20 days! Woot! Glad to know I'm not the only one who likes AK. Our best day of our April trip was there and I look forward to taking her back. I love it and I loved watching Audrey look in wonder about everything at AK. Glad to see some of my many photographs of you guys put to good use. What will AK hold for us this time? Think she will be able to watch Nemo? Good job on the photos, Chris. You had the camera during Pangani Forest Exploration Trail. That's why I had so many shots. I didn't have nearly as many to work with from Maharajah Jungle Trek. No lie, you took 600+ photos in those two hours from the trail to the safari and back. When my daughter was a toddler, we spent hours watching the meerkats! You are so right, the trail there is wonderful!